Well this is just going to blow my entire blog here, but I have some unfortunate news. 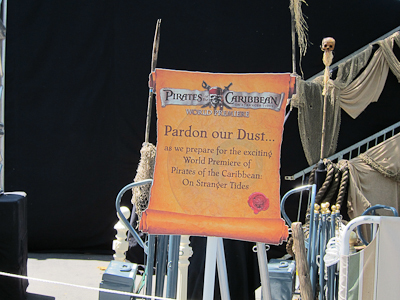 I won’t be attending the “Pirates of the Caribbean: On Stranger Tides” movie premiere on Saturday, May 7th. I know, I know, I hope you will still follow me. Except for the part where tickets cost $1,000. Each. I love you people, but I don’t love you THAT much. To be fair, the ticket price goes straight to the Boys and Girls Club so it IS a tax-deductable donation, but that would require you to have a thousand dollars to tax-deductibly donate, which I do not. And you do get dinner and access to some rides and you get to hang out with some celebrities and you get a goodie bag, but that goodie bag better be filled with ten $100 bills for me to pay that kind of money to go to this premiere. And it’s not. But wait! You can also go and stand next to the red carpet, which is black this year, and snap pictures of the celebrities. And I’d totally LOVE a picture of me and my favorite mulleted undercover cop of my formative high school years. I wouldn’t even mind that my favorite character from previous movies, the guy who WOULD have won a gold medal in archery at the Olympics if the stupid committee had stopped insisting that “Elves don’t have an official delegation,” isn’t actually in this one. Hey South Korea, you may have dominated Olympic archery for over a decade, but Legolas can wait. He's immortal, and when Elves are recognized, he's taking you DOWN. And hey, it’s free to just hang out next to the red black carpet. What’s there not to love about free? So I was all gung-ho to do that, but then I found out that you literally have to camp out there in your spot all day, starting at like 5am. BUT, I will throw you all a bone here. I went to the park earlier this week and caught some shots of the PoTC:OST setup. "Pardon our dust"??? This thing is frickin' HUGE! 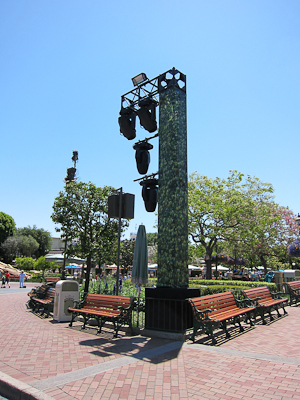 Over at the hub, there are giant posts with lights and stuff attached. They are so cleverly camouflaged, I also ran into one before I saw it. Are we supposed to believe this is a tree? But the real action is over on the Rivers of America. According to the LA Times, PoTC:OST will be projected on a bigass 3D movie screen on Tom Sawyer Island, which is only fitting because they replaced every single Tom Sawyer-ish thing on the island with pirate stuff. Poor Tom, he’s lucky he even gets to keep the island name. Anyway, so they’re showing it on this screen, and they built the huge bleachers to sit everyone. Bleachers are larger than they appear. No joke. I guess they needed divers to put in supports for the bleachers, since they had to extend out into the river due to something about 3D needing a narrowing viewer area than 2D or something like that. And the island itself was under massive construction. But the real question is–what are they going to do with all of this stuff on Sunday? And all of you 21 Jump Street fans, check out Johnny’s PSA from 1988. Boy, those were the days. 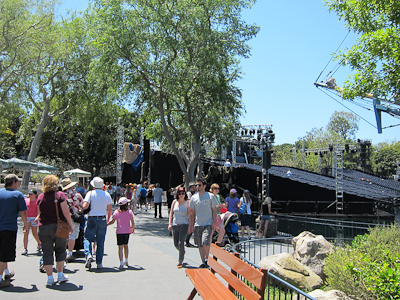 I had no idea that movie premieres factored into Disneyland parks history! I’d love to hear more about that. The thing that gets me when I see these pictures is thinking about how many people are employed because of this company. It’s crazy how big and fast they build (and will tear down!). I don’t know much about movie premieres at Disneyland either, except for a few vague memories that such things did occur. Blame the limitations of my Standard Research Methodology for that. Shelby, you totally made the right decision! I saw on the Disney boards that you were considering going, and I figured you had no idea what a long day you were in for. Although I would have enjoyed your post about the premiere, I completely understand! 😆 Lisa. If I were 20 years younger, I totally would have done it. *sigh* But I still would love a picture with Johnny Depp! Maybe I’ll get super lucky and run into him at a popcorn cart or something. Aww Shelby what a lovely name I have a friend with the same name, good article I do like it and I love disney $1,000 is a wee bit expensive but other that all looks good.